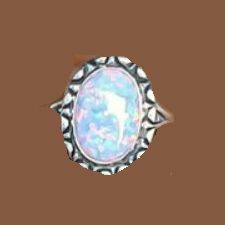 This Sterling Silver ring has a white opal stone. The oval stone measures approximately 5/8" x 3/4" across. The band is approximately 1/16" wide. Available in sizes 7.5 or 8.